Making a rich and tasty low carb gravy or jus to finish off that favourite roast dinner can be challenging but give it a go. Adding flavours to your cooking makes all the difference. The instructions below can be adapted for your choice of meat and preferred flavours. Cut 1 lemon or lime into quarters and stuff into chicken cavity. 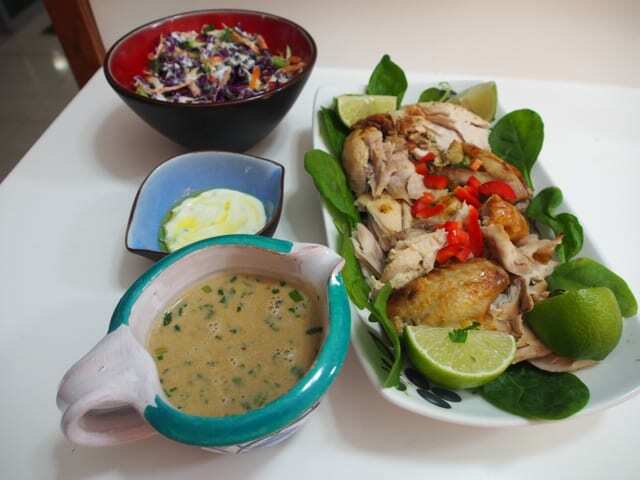 Baste chicken with Fresh Herb Paste. Add your chicken to your baking dish. Add 1 cup of water or stock and ½ cup red wine (optional), plus slices of garlic, ginger, fresh herbs, or vegetable scraps (just as you would if you were making your own stock). Bake as per usual, turning the chicken at halfway and re-basting. When chicken is cooked, remove from baking dish. Pour remaining liquid into a pot through a sieve to catch herbs/vege etc. Now let that liquid simmer until it has reduced to a thicker consistency (approx 10 mins). Before serving add a small amount of cream, whole grain mustard, fresh herbs, salt and pepper. This gravy will be different every time you make it so be bold with flavours and make this sauce your own.